Nigeria suffers an acute shortage of qualified teachers, particularly in the north. Many currently employed teachers aren’t fully qualified. In Jigawa, for instance, 56% of teachers are not classified as qualified. More than this, recent assessments of teacher effectiveness indicate that teacher knowledge is typically quite poor. 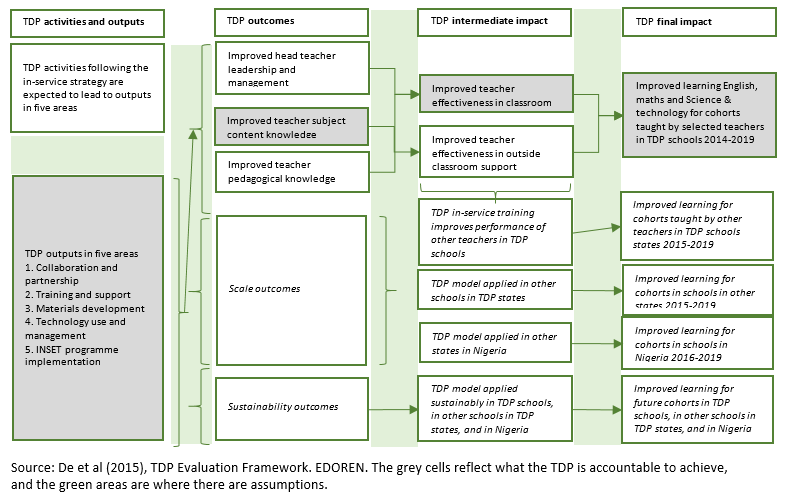 Sustainably improving the effectiveness of teachers is difficult in any context, but particularly in Nigeria. Many teachers in post are poorly motivated, often absent from school and leave the profession easily. Partly, this is a result of low pay and working conditions, as we explore in our forthcoming research on teacher management, and partly reflects the low societal status of the teaching profession. But it is vital. International evidence suggests that teacher effectiveness has a significant impact on learning outcomes, and without good teachers, other interventions are unlikely to work. The specific challenges facing teachers in Nigeria mean that learning what works to improve teacher effectiveness here will be critical to lasting improvements to educational outcomes. But the wider literature tells us that only programmes that deal effectively with the context are likely to be successful. The Teacher Development Programme (TDP) will work until 2019 in Jigawa, Katsina, Zamfara (phase 1, 2013-2019) and Kaduna, Kano and Niger (phase 2, 2016-2019) to improve learning outcomes by improving the quality of teachers through in-service and pre-service training. As part of the evaluation of the in-service training component, we’ve developed the graphic below of the theory of change. Our evaluation will measure the impact of the TDP on student learning outcomes and on teacher effectiveness, and will explain these impacts. We know context matters, so we will be able to see whether the TDP has taken adequate account of it. Baseline results will come in June 2015, and final results by June 2018. 27th February 2015 in Blog.